SMP or scalp micropigmentation is the process in which tiny dots of permanent ink are deposited into the dermal layer of the skin to replicate the look of human hair. SMP is basically a tattooing process. In SMP, a special injector is used which has a very fine tip. 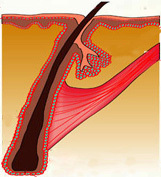 Ink is loaded into the injector and the ink is then deposited into the upper layer of the dermis at the required areas. Multiple small dots are made whose diameter is the same as a human hair. This hides the appearance of a bald scalp and instead makes it appear as if there is hair in these regions also. The dots of SMP last from 5 years to 10 years. Individual differences in the lasting of the process are present depending on a person's skin type, circulation, etc. SMP is a camouflage process, that is, it is a cover-up of bald areas. It can however be very effective. SMP is most useful in cases where there is thinning of hair and the bald scalp shows through the hair. In such cases, SMP covers up the bald areas and the thinning hair is not noticeable anymore. Hence it is most effective in cases of female pattern baldness, where there is diffuse thinning of hair all over the scalp. SMP can be very useful in such cases. It is also similarly useful in males where there is thinning of hair in some areas. SMP can also be used on the completely bald scalp where it gives the appearance of a finely shaven head with normal hair. 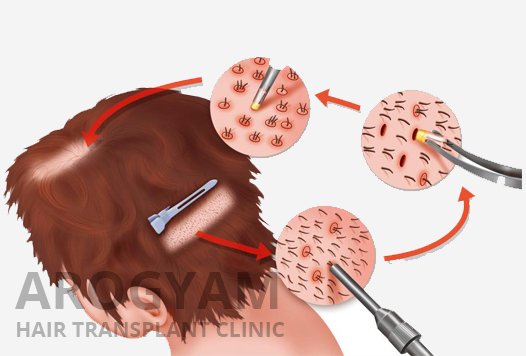 It can also be used in the back of the head after a big hair transplant procedure to cover up any appearance of thinned out hair at the donor area. It can be used to cover up the scar of FUT or STRIP method hair transplant. It can be used to cover up scars on the head or moustache or beard bearing areas, and to give the appearance of thicker moustache or beard. Cost of SMP varies according to the area to be covered. A small scar on the lip for example would cost only about Rs 1000 while the full scalp in female pattern baldness would cost Rs 5000. In case of female pattern baldness where the whole scalp is to be covered, the process is done in two sessions. The whole process is done under local anesthesia, and so it is virtually painless or with minimal pain. The process can take just a few minutes for a small scar up to two hours for the whole scalp. Contact at 9854041111 to know more about this procedure.